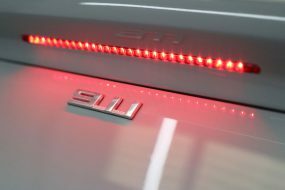 The M3 is BMW’s performance enhanced version of their popular 3 Series model. For the M3, BMW’s in-house motorsport division, BMW M GmbH developed more powerful and responsive engine, improved suspension and braking systems, replaced a number of components with lighter weight materials, and added aerodynamic body enhancements, all resulting in a car that, whilst it looks like a standard 3 Series, handles like something else entirely! The BMW S65 V8 naturally aspirated engine produces a maximum power output of 414 bhp at 8,300 rpm, with a peak torque of 295 lb⋅ft at 3,900 rpm. When Car and Driver magazine took the 2011 E92 Coupe out for a test drive, they found that, when equipped with an M-DCT (automated dual clutch) transmission, the E92 accelerated from 0–60 mph (97 km/h) in 3.9 seconds – half a second faster than its predecessor. All this, and yet the only give-away to the true essence of the vehicle is the smattering of discreet tri-colour “M” (Motorsport) emblem around the car. As the saying goes, ‘never judge a book by its cover’! This low-mileage E92 M3 arrived at UF Studio for a variety of treatments to restore the appearance, inside and out. Although the previous owner had cherished his vehicle, when the new owner acquired it, he was keen to have the M3 restored cosmetically to as high standard as possible. 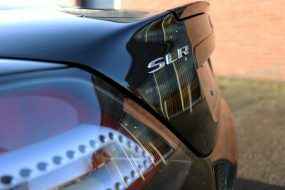 Initially, a 2-stage Gloss Enhancement was required to eliminate swirls and scratches from the paintwork. 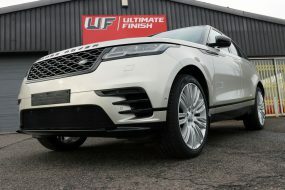 A paint protection film (PPF), XPEL ULTIMATE Plus, was then to be installed on the areas particularly vulnerable to stone chips. ULTIMATE Plus is constructed from advanced elastomeric polymers with self-healing properties: with the application of heat from the sun, hot water or from a heat gun, light scratches and swirls will disappear to leave the surface pristine again. Additionally, ULTIMATE Plus has been treated to resist discolouration due to contamination and ultra-violet radiation, keeping the film optically clear and imperceptible to the eye. To protect the finish of the paint and the PPF, after consultation, the owner selected Kamikaze Collection Zipang Coat, a flexible ceramic coating that also has a self-healing function which, with the application of heat, eliminates minor swirls and scratches from the surface. Zipang Coat has been formulated using high quality ingredients and engineered with Kamikaze Collection’s ultra-low molecular weight hydrocarbons to produce a coating with extreme water repelling properties. Extensive research and development has enriched these ingredients to increase their performance and enhance their reflective potential to deliver a gold-medal winning shine. Wheels and wheel arches were cleaned with UF Safe Wheel Cleaner before being degreased. These areas were then treated for brake dust contamination using UF Iron + Fallout Remover. After rinsing, the rest of the car was also treated for diesel and road grime, brake dust and adhesive contaminants. The car was pre-cleaned using Ultimate Snow Foam, the thick creamy lather lifting larger particles of dirt and grit away from the surface, encapsulating them within the foam. The foam and contamination can then be easily rinsed away before a wash mitt comes into contact with the bodywork, helping to prevent swirls and scratches. With as much contamination removed as possible, the M3 was washed using UF Pure Shampoo, and two buckets with grit guards, keeping the wash water separate from the rinse water. This helps to prevent dirt removed from the vehicle being reintroduced to the paintwork where it can damage the clear coat as the wash mitt is rubbed back and forth. Once clean, the M3 was rinsed clear of suds before an Aqua Gleam De-ionising Water Filter delivered a final, pure water rinse. At this point, the M3 was brought into the studio where it was carefully placed on a hydraulic ramp so it could be raised and lowered, allowing easier access to all areas during the detailing process. A BigBoi BlowR Pro touchless car dryer was used to drive water out from areas that naturally trap it, such as around badges and grille fins, around door sills and seals and from the exhaust tips. The damaged M3 badges were removed from the air vents and then the wheels were removed for further cleaning, degreasing, polishing and protecting. 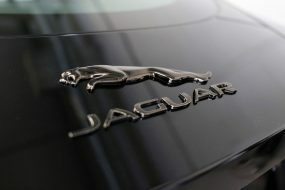 The paintwork was inspected under high-intensity lighting to reveal swirls, scratches, and stone chips. Areas of particular concern were noted on the Vehicle Appraisal Sheet for reference during the initial enhancement stage. Paint depth measurements were taken over multiple points on each panel prior to machine polishing commencing. Original paint for repairing the stone chips was sourced and applied to the damaged area to fill in the gouge the stones had left in the surface. The paint was allowed to harden. The repaired stone chips were wet sanded using a RUPES Ibrid and 35mm P3000 abrasives to flatten the paint. Using RUPES BigFoot dual action machine polishers, an LHR 12E Duetto and an LHR 75E Mini, with Meguiar’s DA Microfibre Cutting Discs and Koch-Chemie H8.02 Heavy Cut Compound, the paintwork blemishes were removed. H8.02 contains diminishing abrasives that begin as larger particles, tackling the more severe blemishes. As the compound is worked, the abrasives break down to leave a refined surface ready for final polishing. The paintwork was then refined using Menzerna Super Finish Plus 3500 to leave the paintwork glossy and ready for both the PPF installation and a ceramic coating. The refining stage ensured the repair stone chips blended almost imperceptibly with the original paintwork. PPF installation is a highly skilled process. Generated from a computer-controlled programme, the film is produced specific to the make and model of the vehicle. Once the protective backing has been removed, the film is laid over the appropriate section of the car and then stretched or compressed and then smoothed to precisely fit the contours. The film is wrapped around the leading edges to finish under the lip to ensure no visible edge. The owner opted for the XPEL Standard Kit-1, involving the front bumper, whole bonnet, both front wings, A-posts, leading roof edge, rear wheel arches and door mirrors protected with PPF. PPF requires time for the fixing gel to evaporate and the film to settle after which, the film can be protected with a ceramic coating to add slickness and hydrophobicity. Whilst the film was settling, the interior was vacuumed, the hard surfaces cleaned with Gtechniq C6 AB Matte Dash to provide a satin finish with a dust repellent and antibacterial function. The leather seats were cleaned using Colourlock Mild Leather Cleaner. This foaming cleaner is applied using a sponge and then worked into the material to lift dirt out from the leather grain, using a Leather Brush as required. The leather is wiped with a soft microfibre cloth and allowed to dry. The results are impressive as this 50/50 image shows! To finish, the leather was protected using Colourlock Leather Shield, a flexible coating that repels dust and water, helping prevent stains and abrasion scuffs. UV inhibitors protect the leather from the damaging effects of the sun’s rays, helping to prevent it drying out, becoming brittle and susceptible to cracks or tears and maintaining the red pigment in vibrant condition. The exhaust tips were in need of cleaning to remove baked on soot and tarnishing. A cone-shaped foam was attached to a drill and, using Britemax Easy Cut Metal Polish, the tips were thoroughly polished, inside and out to reveal the brilliant shine. They were protected using Britemax Final Shine Metal Sealant. 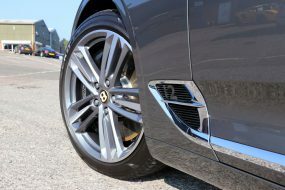 In the future, the exhaust tips will be less susceptible to tarnish and sooty deposits will be easier to clean away during the weekly maintenance wash.
Once removed from the vehicle and with the centre caps taken out, it was clear the wheels would benefit from intensive cleaning and polishing. The wheels were treated with Gtechniq W7 Tar & Glue Remover to eliminate bitumen residue and to remove the adhesives from the wheel weights from one of the rear wheels which the owner had requested be rebalanced. The front and rear of the rims were treated with UF Iron + Fallout Remover. The colour change function indicates a significant amount of brake dust was present. The wheels were then washed again and clayed using UF Pure Shampoo as a lubricant. The clay shears away stubbornly bonded contamination to leave the surfaces smooth to the touch. The wheels were polished using a FLEX XFE 7-12 80 Roto Random Orbital Polisher with a RUPES 4 Inch / 100mm Green Medium Polishing Pad and Menzerna Heavy Cut 400. This combination restored the lustre to the rims leaving them ready for a ceramic coating that would protect them from future brake dust build up. After wiping the rims with Gtechniq Panel Wipe to remove polish residues, Kamikaze Collection Stance Rim Coat was applied. The wheels will now repel dirt, water and waterborne contamination and road grime, making the wheels easier to maintain during the weekly wash. As Stance Rim Coat is virtually impervious to extremes of pH, the wheels also now have protection against salts and chemicals commonly found on wintry roads. New centre caps were mounted into the wheels to complete the look. The wheels were balanced and replaced taking care to ensure the correct factory torque settings were used. Kamikaze Collection’s hydrophobic glass sealant, Intenso Window Coat was applied to the windows. This encourages rainwater to bead on contact with the treated surface and the airflow from driving, even at relatively low speeds, drives the beads of water away from the glass. This keeps the windscreen clearer during inclement weather, improving visibility and in turn, helping to reduce eyestrain and fatigue for the driver. The new M3 badges were mounted to the wings before the car was prepared for Zipang Coat using Panel Wipe. Zipang Coat was applied to the car using the specific instructions detailed by Kamikaze Collection. Their research and development department have spent many hours finding the most effective way of laying down the coating to ensure optimum performance. The coating also relies on ambient air temperatures and humidity levels being within certain parameters for it to cure effectively. For these reasons, Zipang Coat is available as a service only and exclusively through the Kamikaze Collection trained and certified detailer network. Once coated, surfaces repel water and waterborne contamination, keeping the car cleaner, longer. Dirt and road grime will not adhere as effectively to treated surfaces making the M3 easier to wash, reducing the chances of inflicting swirls from vigorous rubbing at the paintwork. Finally, the reflection and shine Zipang Coat imparts is outstanding! A coat of Gtechniq T2 Tyre Dressing finished the look with a natural, satin sheen to the tyres and the restored and protected M3 was ready to go!